A new radio campaign released by Moms Demand Action for Gun Sense in America is demanding that Kroger, the nation’s largest supermarket chain, stop allowing the open carry of guns in its stores. Kroger has heard the spots and is pressuring radio stations to stop airing them. They also bussed their investors away from a planned meeting early last Wednesday morning (Oct. 29th) in Cincinnati to avoid a Moms Demand Action rally. 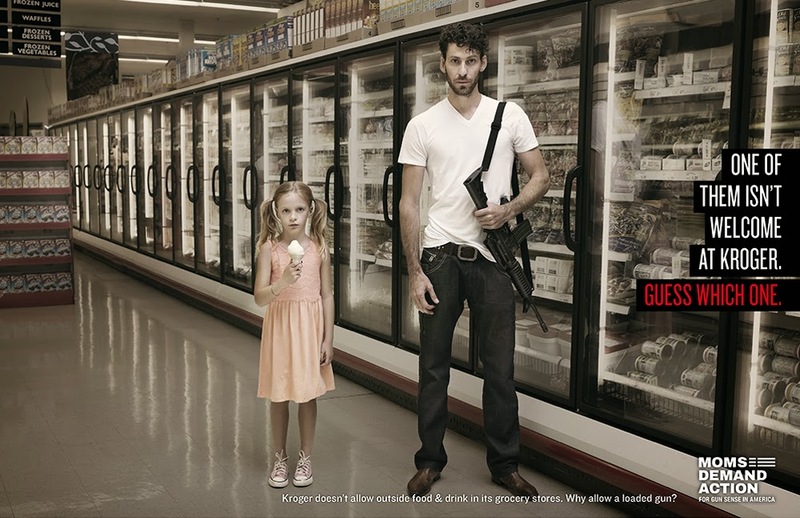 The ads feature recorded phone calls to real Kroger stores, where employees attempt to explain why pets and children’s scooters are prohibited from its stores citing safety concerns, while allowing anyone to open carry loaded guns inside Kroger stores. “Our ads are nothing more than Kroger employees reiterating Kroger’s policy, which is to prohibit children’s toys and household pets in the name of customer safety, but to allow anyone to openly carry loaded firearms, even though no permit, training or background check is required to do so in most states,” said Shannon Watts, founder of Moms Demand Action. 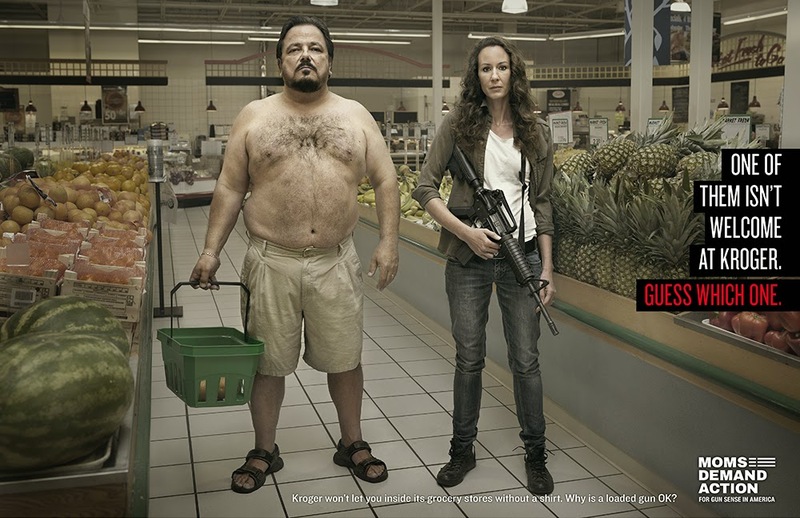 This new radio campaign builds upon recent billboard, print and digital ads featuring individuals open carrying firearms in the aisles of a supermarket alongside other objects prohibited from most Kroger stores, including outside food, skateboards and a lack of appropriate attire. The campaign was created by the Toronto office of GREY. Paid for by the Everytown for Gun Safety Action Fund, the ads are running in the Cincinnati area during the Kroger investor meetings happening there this week. It comes on the heels of a new poll conducted by Beneson Strategy Group that shows 64 percent of Kroger shoppers believe people should not be able to openly carry guns in Kroger stores. While Kroger has not yet changed its open carry policy, other major brands, including Target, Starbucks, Chipotle, Sonic, Jack in the Box, and Chili’s, are now asking guests to leave their firearms at home.